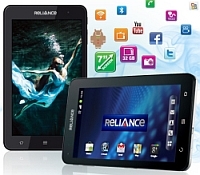 Reliance Communications launched the cheapest 3G enabled tablet model in the country priced at Rs12,999. The tablet runs on the Android operating system and is the first tablet offering from the company. The tablet code named 'Reliance 3G Tab' has a 7 inch TFT-LCD WVGA capacitive touchscreen display (480 x 800 pixel resolution) and is manufactured by the Chinese company ZTE. It runs on the Android 2.3 (Gingerbread) operating system and is custom-made for the Reliance network. It has 512MB of RAM, runs on an 800 Mhz CPU and offers up to 32GB of storage with the help of a MicroSD card (it already comes with a free 4GB MicroSD card from Reliance) . The tablet has a 2MP rear camera with video recording capabilities and a front facing VGA camera. As the name clearly states, Reliance 3G Tab can function on 3G (although the device is also compatible with 2G voice and data), which is a positive aspect since it has been priced so aggressively. The tablet is Wi-Fi enabled and can also function as a Wi-Fi hotspot device. Additionally it comes with a number of pre-loaded applications like R World Online, You Tube, Google Map & Google Search and Gmail among others. The tablet weighs 389 grams and has an inbuilt FM radio. Reliance claims that the tablet will give up to 9 hours of talk-time and 300 hours of stand-by time with the help of a 300mAH, Li-On battery. Other features of the device include GPS, MobileTV and Voice calling. The closest competitor of the tablet in terms of price is the Olive Pad which is priced at Rs14,500 while on the other hand, the prices of high-end tablets like Apple's iPad2 and Samsung's Galaxy Tab are in excess of Rs 20,000. To further attract customers, Reliance is also offering special tariff plans that will offer up to 51 per cent discount to the Reliance 3G Tab consumers. The company is offering 3 months data usage plans with a data limit of 1GB, 2GB and 5GB. These can be bought at a discounted price of Rs 4,500, Rs 5,500 and Rs 7,000 for a period of 12 months. And since Reliance is a leading 3G provider itself, we can expect them to provide the consumers with good internet speeds. Although the tablet is not a powerful one, I have to say Reliance has done a pretty decent job with it, especially when one considers the price of the tablet. But it would have been better if Reliance had included the latest Android 3.0 (Honeycomb) OS in the tablet instead of the Android 2.3 OS. As of now the tablet has been launched in Mumbai, Delhi and Kolkata but it will be made available in other cities in the coming days.